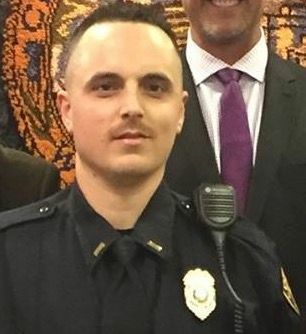 Lieutenant Aaron Crook was killed in a vehicle crash at the intersection of Princeton Avenue and Lee Street shortly after midnight while involved in a vehicle pursuit of a suspected drunk driver. 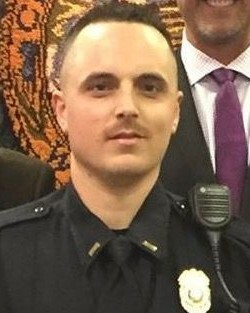 He suffered fatal injuries when his patrol car collided with another Bluefield Police Department patrol car and a West Virginia State Police patrol car. He was transported to Bluefield General Hospital where he succumbed to his injuries. The officers in the other two patrol cars suffered non-life threatening injuries. The subject involved in the pursuit was arrested and charged with several felonies and misdemeanors. Lieutenant Crook was a U.S. Marine Corps veteran and had served with the Bluefield Police Department for nine years. He is survived by his wife and two children. On behalf of my family, I extend our sincerest condolences on the grievous loss you suffered when Aaron died in the line of duty. To the Crook family, fellow deputies, and all who call Aaron beloved, my heart goes out to all of you and may you find comfort in your loved ones and your strength in your faith. When my son was killed, the entire law enforcement community in our area embraced us in a circle of love and support, and I know you will receive the same support. It makes the unbearable less torturous, and I pray for your solace. I hope that your family knows that a nation mourned for you. This reflection is sent with the utmost respect for the dedicated service Lt. Crook gave to his community and the citizens of West Virginia and for the supreme sacrifice he and his family made on May 30, 2017.